I wonder what my fascination with the London underground is! I discovered it in 2007 on my first visit to England! 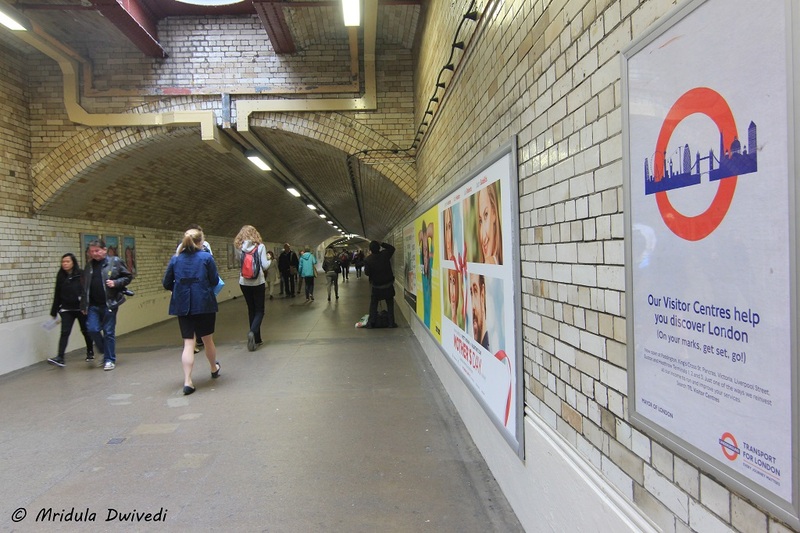 I was mesmerized with ‘mind the gap announcements.’ I think I wrote about it then as well. Let’s move forward to my recent visit to England this year. I had an Oyster Card and Google Maps; I was ready to go! I bought a data card to use Google Maps but then I had enough data to keep using all the social media I wanted to! I bought the Oyster Card at Heathrow T5 without any hassle. The first tube I took was from T5 to Hounslow Central as that is where my hotel was. My first brush with the London Underground, 2016 addition, was memorable. I got down at Hounslow Central Tube Station. I believe it’s an old station, there are no Elevators/escalators, only steps. That is not a problem for me but I was arriving from the airport and I had a big suitcase. At every other place I only had to drag it but now I had to carry it over the steps. Still as I was going down I knew I would manage. As I took a few tentative steps down the staircase a gentleman came from behind and said “You need some help with that” and simply took away my suitcase. He carried it down all the way and gave it back to me at the very end of the steps. All I had to do was to drag it through the barriers. I so Enjoy Traveling on the London Underground! I came back to the underground the same evening. I went to the Victoria station looking for Golden Tours office as I had a few trips booked with them (courtesy Visit Britain in India)! The station brought back so many memories from the 2007 trip. But the fool that I am I did not click a picture of that beautiful station this time. 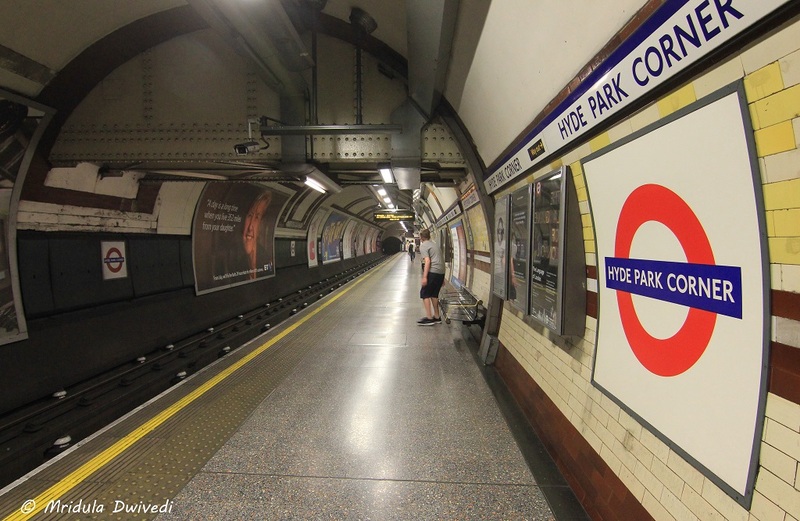 Anyways I hope I will go back to London and then click tube stations to my heart’s content. 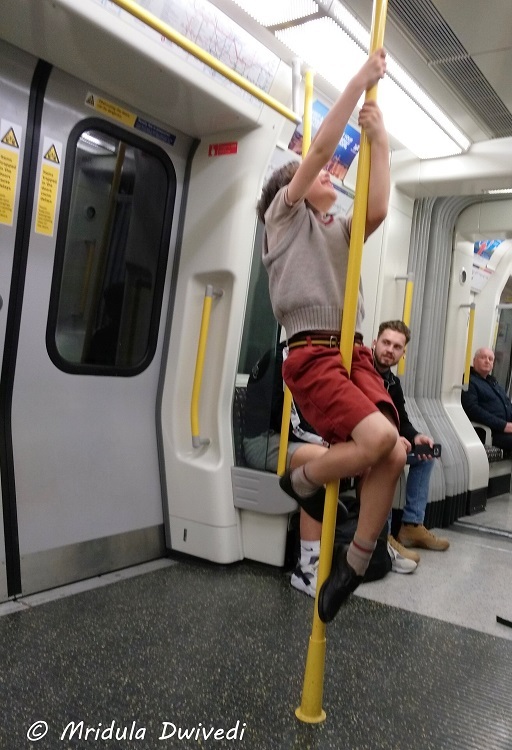 On one of my journey on the tube I saw young boy in the school uniform trying to climb up the pole in the center of the coach. Kids will be kids everywhere! It reminded me of my daughter who does the same in Delhi Metro. The amount of energy the kids have even at the end of the school day! Then one evening I saw a musical procession passing through the coaches. I actually heard it first. I was surprised, I did not expect something like this on the tube! Then at home today, I was searching for London underground on Google. I came across the term busking! So you have to be really talented to play music on London underground! You need a license to do so! I don’t know what is it with me and HOHO Buses. 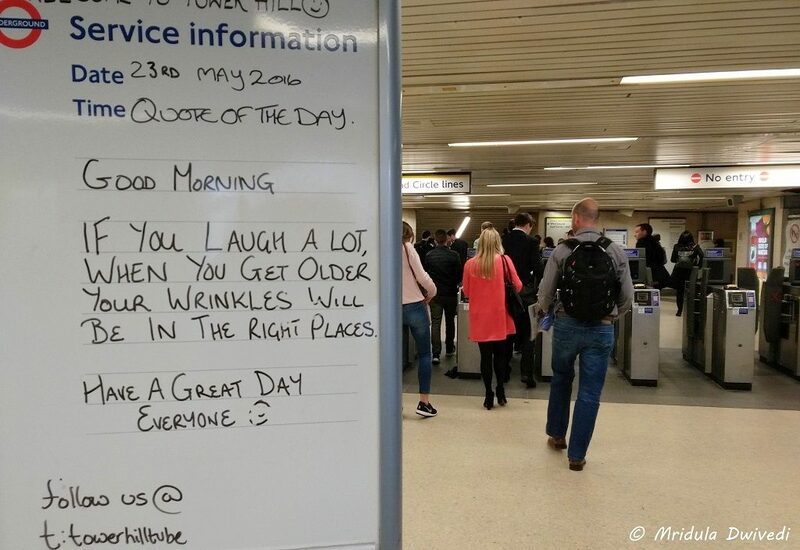 I prefer the tube any given day to HOHO, just don’t ask me why! I am sure I do not know how to use the HOHO buses properly. I sit on them, I go through the whole circle and then I am like what? It has happened to me in more than one cities. I abandoned my HOHO Bus ride in Edinburgh too but put me on London underground and I don’t mind travelling for 45 minutes to reach the next destination and explore it. The biggest surprise that I got on the London underground was a Twitter message by the ‘On the Move’ magazine. They somehow found my tweets about the #londonunderground. They said a correspondent from the magazine would get in touch with me. I thought someone would get in touch over the email. Sure enough I got a mail from Nicholas Dawson. But they wanted to set up a face to face meeting. I said let us meet at Westminster as I find it such a happening place! So that is where we met! Nicholas showed his press credentials to the station staff and we were chatting with David and Yuksel who work for the tube! It was such a fun meeting! 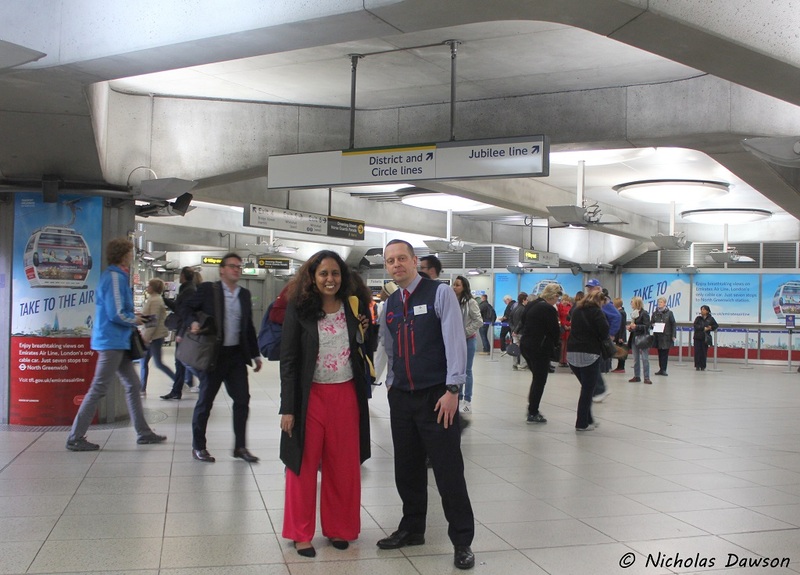 With David, Who Works at Westminister Tube Station! I asked David, “Westminster is a big tourist hub, so what do tourist do?” Yuksel exclaimed- “the toughest is when they leave their kids behind!” David said as far as the tourists are concerned “the sky is the limit to the things they can do”, though he did not elaborate further! He said the most commonly asked question is “where is the restroom.” I agreed as I could not find the restroom easily myself. David mentioned that they are outside the station. For me as a tourist, the biggest fear was that somehow I would end up not having enough money on my Oyster card. They said it was the easiest problem to solve. I asked him what would happen if I really did not have money. They mentioned that if it was late at night and I was a woman in all probability they would let me go. They also said after working for so many years they think they can judge a genuine case from a fake one! They also mentioned that only a few people try not to pay the fare. My visit to the control room at the Westminister was the highlight of my tube experience! It was fun, I never even imagined it was possible. The station staff was extremely helpful and friendly but then that has been my impression since 2007. In the end it was the time to go. I came back to Hounslow Central which was a station which has no tube stuff. There was a surprise inspection going on, the Inspector decided to stop me and check my tickets. I’m happy to report that my ticket was alright. I had enough money and I did not miss calculate fares right till the end. Later, I headed back to the hotel to collect my luggage and started my journey to the airport. But wait, I am getting the sequence wrong. I went out went shopping in Hounslow and then went to the hotel, took my luggage and came back to Hounslow Central Tube Station. Heathrow is a short hop from there. I had the stairs waiting for my suitcase again. Walking behind me were two strapping London police officers. By the time I reached to step no. 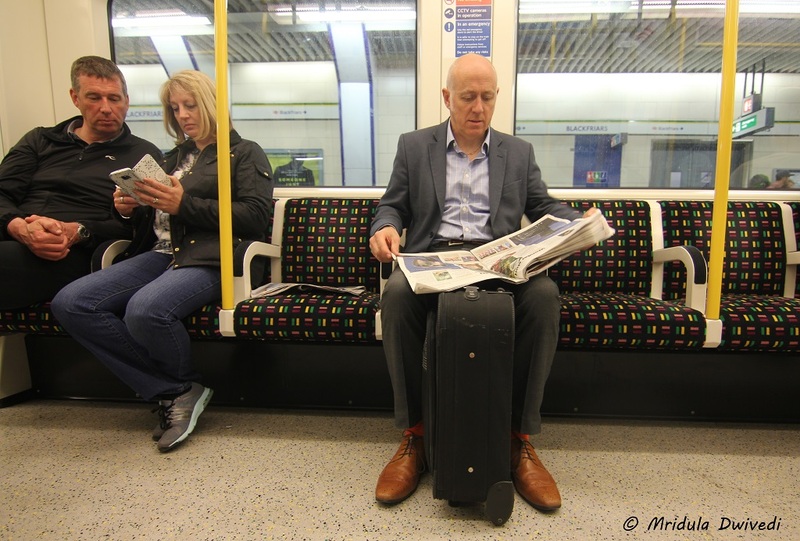 2, one of them relieved me of my suitcase and said, “you run along I will bring it up for you.” So that is how my Rendezvous with London underground ended! But there is one last story to tell. I arrived at the London Heathrow Terminal 5 tube station and I had to return my Oyster card. I was wondering how easy or difficult it was going to be. I waited in the queue of the clueless tourists and finally it was my turn. After greeting the staff, I said I would like to return my Oyster card. He took it back with a smile and gave me £11 and some change. I used that money to buy beer at the airport. So that is actually how my affairs with London underground ended. I hope I will get a chance to renew my affair with it soon. PS. I was featured in On the Move (OTM) the magazine of the London Underground in their August Issue. That was a great read. The UG stn looks so clean! Excellent captures. Rajeev I so liked it, both the times people helped without asking! Cool post with amazing photographs!!! Such an elaborative post, easy to connect. Specially I was amazed with those helping hands on yours to and fro journey. Yes Priyanka it amazed me too! And that is what travel does, shows us how helpful people are ! A lovely read:) I loved the last picture! You will soon! Take care. How true…Kids are the same in every part of the world 🙂 The tube is so clean…loved reading about your experience. Beautiful clicks! Such clean stations. I loved the pic with the little boy clinging on the metal rod the best. Thank you Rekha, kids do it all the time in Delhi Metro too! I am a fan of the tube and busking too. Nice post, you getting into control room, so nice. Yes Srinivas being in the control room was an amazing experience! Lovely post Mridula. Made me nostalgic for the tube. Kalpanaa I so want to go back only for the tube! I know it sounds slightly crazy but that is how I feel! Yes I agree! It was amazing that people helped me without even asking! Londoners seem to be really friendly and helpful. 🙂 I’d love to go back again. 2014 seems like ages ago. Pooja this might be more helpful in practical matters!